Tender noodles and juicy Italian-seasoned chicken breast are tossed with an easy 5-minute creamy pesto sauce! A perfectly tasty and comforting dish for those busy weeknights! Spray a large pan or skillet with cooking spray. Season both sides of chicken breasts with Italian seasoning and cook over medium-high heat 4-6 minutes on each side until juices run clear and completely cooked through. Transfer chicken to a plate and slice into strips or cut into bite size pieces. In the same pan where you cooked the chicken, melt butter. Add garlic and sauté 1-2 minutes until garlic is fragrant. Add flour and stir until a ball forms. Gradually whisk in half and half (or heavy cream) until mixture is smooth. Whisk in pesto. Continue to stir until mixture thickens. 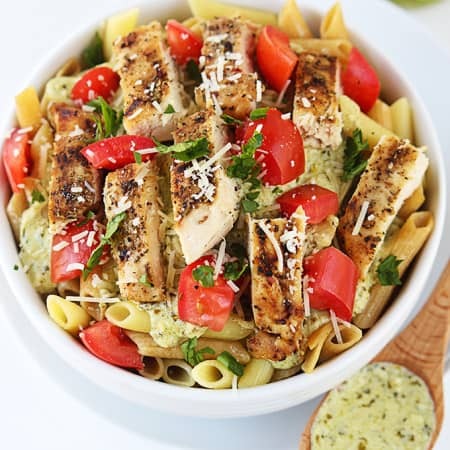 Pour creamy pesto sauce over noodles and top with chicken and remaining optional ingredients OR add noodles, sauce, chicken and optional ingredients to a large bowl and toss together. Serve warm.